I’m a bit late in noticing this. 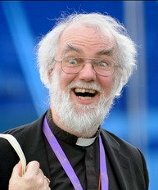 On the fourth of May 2010, Rowan Williams, Archbishop of Canterbury, preached a sermon at Charterhouse, London (the text of that sermon is here). Charterhouse – now a boarding school – is a former Carthusian monastery in London (the Carthusians were a Catholic order), and that’s why Williams was speaking there. Now, why would the Archbishop of Canterbury speak at a Catholic monastery? That’s right, the Archbishop of Canterbury suggested that perhaps the head of the English Church, the King, might in fact be lost after all. Apparently Henry, despite his accomplishments, may end up burning in hell. At least, that’s what the highest ranking minister in the Anglican Church says—the man inhabiting an office (of tremendous power and influence) that only came into existence as a result of the bold and visionary actions of Henry viii! “If Henry vii is saved — an open question, perhaps — it will be at the prayers of John Houghton,” Williams then stated (emphasis mine throughout). The inference is clear: According to the head of the Anglican Church, the decision to send Henry viii to heaven or hell rests with a Catholic priest! Acknowledging wrongs of the past is right, whether Rome will admit hers or not. I would dearly love to see the Pope speak publicly on the anniversary of the merciless killing of the Protestant Oxford Martyrs (or many other victims of the Church’s wrath), acknowledging the evil that was done, and perhaps even calling into question the genuine Christian commitment of those who ordered the killing (leaving the question open and in God’s hands, of course). Surely the fact that Rome has not done this is all the more reason to do so, to perhaps prompt a spirit of mutual recognition of evils done – or at very least to pour burning coals on the head of those who see us admitting the very wrongs that they will not. Far from “selling England out,” as the attack alleges, surely this is a case of redeeming her. But beyond all that, here’s why I like Williams a little more because of this one line: In spite of the appearance of being the face of a soft faith, one that never wishes to offend, to exclude or to give the impression that anyone is ultimately lost, Rowan Williams had the balls to say that maybe the King of England is going to end up in hell on judgement day. He’s not a Universalist. He’s an exclusivist, and he’s putting the throne on notice: You are not above God’s law. Is there a tag for the Archbishop of Canterbury’s gonads ? Where did you find that picture? I normally think the ABP looks like a wizard from the Harry Potter series because of his eyebrows, but now I might always associate him with a crazy homeless person from now on. Lol, what a crazy photo. You think thats crazy? You obviously havent seen him in his druid outfit. I find this man very frustrating. Generally speaking, Anglican ministers are among the most affable clergy you will ever meet. I had the pleasure of golfing with one a couple of weeks ago. I snapped my lob wedge in two on the first hole. Typical angry atheist move …. You are the one who persuaded me universalism is untenable exegetically. But even if you hadn’t I’d agree it’s important that the Archbishop shouldnt be a universalist. People should respect their denominational confessions or jump ship. There’s more leeway for laity.